Get On The Tour Bus! 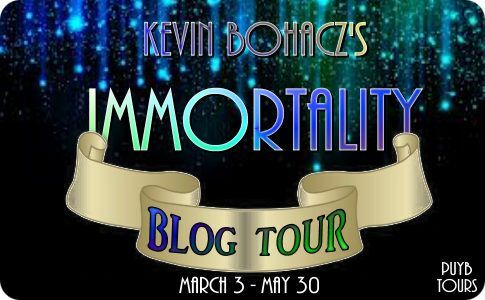 Immortality by Kevin Bohacz! 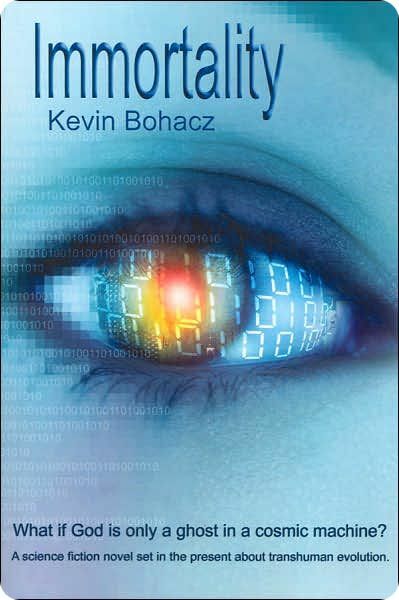 Transhuman evolution – the next step? Click to order! Amazon Forest: January, present day. The rain forest had a humid, earthy smell that reminded him of home. Diego was twenty-two years old and, like most of his village, he’d spent half his life away from home. The bulldozer he was illegally operating was idling in neutral. In front of him were a half dozen control levers and gauges. With a worker’s rough hands, he compressed the squeeze-grip on a lever and pushed forward. He heard the sound of grinding gears. The tree cutter failed to engage. The huge dozer was thirty-year-old army surplus. There was a cable problem in the lever he was working. The problem sometimes caused the squeeze-grip to snap shut when the transmission grabbed. If he was not careful, the squeeze-grip could badly pinch his hand. Diego pushed harder on the lever. He could feel teeth missing in the gears from how the lever bucked back against his push. Without warning, the gears dropped into place as the squeeze-grip bit his palm. It was like a vicious dog. An angry welt throbbed in his palm. He cursed the dozer. He cursed the steaming heat. He’d drunk two quarts of water since breakfast, and lunch break was still hours away. The rain forest was alive with insects. Diego had never seen this many in all the years he’d illegally logged the deep forests. There was a steady drone which was louder than the diesel engine he controlled. Tiny no-see-em’s, biting things, had left a rash across the back of his neck that felt like sunburn. Earlier, he’d scratched it raw but now had a bandanna tied around his neck to remind him to leave it be. The bulldozer rocked into a depression as the cutter began chewing through the trunk of a mahogany tree. Diego fed more fuel into the beast’s engine. The dozer’s treads dug in; there was a hesitation. He could feel the strain building. Tons of steel lurched forward pitching him in his seat. Another tree tumbled, its branches snapping like rapid-fire gunshots as it crumpled into the ground. The front of the beast was equipped with a chain driven saw instead of a dozer blade. The fixture had a pair of serrated edges that shimmied back and forth like steel teeth. Pieces of shredded green leaves and bark caught on the teeth’s edges. Diego had long ago decided the beast was a sloppy eater. The insect sounds of the forest had stopped. As far as Diego knew, these insects never stopped. He dropped the beast into neutral then switched it off. Out of this stillness, a faint crackling sound rose from the distance, then disappeared, and then came again. He listened carefully. It took him a moment to realize the faraway sound was trees falling. The logging company operated a small army of dozers, far apart now; but by evening they would all meet up, connecting each of the separate cutting tracks into a solid plot. Diego swung round in his seat and gazed back. A swath of fallen tropical forest lay behind him: mahogany and cedar and even some rosewood along with countless varieties of plants and bushes. The largest trees were left standing so their canopies would hide the results of his work from the few government scouting planes that were not on the company’s payroll. Heavy tractors would come through later to drag out the good logs. He got paid by the yard for mahogany, rosewood, and cedar; the rest was trash. Today it looked like he would earn a small fortune; tomorrow might bring nothing. He lit a cigarette and left it hanging in his lips. After starting the engine, he ground the shifter into a forward gear and moved out. He drew cigarette smoke into his lungs then exhaled through his nose. No time to rest. He needed every bit of money he could earn. He didn’t blink as a cloud of insects flew into his face as their nest was churned into rubbish by his dozer’s teeth. The humidity was so high that water had begun to evaporate into a fine mist. A steam cloud floated through the tops of the trees blurring the upper canopy into a milky green. Diego swung the beast around in a stationary about-face. The base camp was miles behind him by the river. The camp was a dock and tents with ratty screens. Beside the camp was a tree covered clearing that at night was filled with sleeping dozers and other heavy equipment. By now, a pot of beans would be simmering for lunch. A hunk of flat bread and canned beer would complete the meal. No meat. He’d lived worse. Everything here had been secretly brought in by river barge, including him and the other labors. With luck, he could cut a second swath back toward camp and arrive by lunch. Today would fill his pocket with more than two hundred Reals… a new record. The logging ride out of the forest turned out to be easier than the ride in. The trees in his new path were an ideal size for cutting. Diego began thinking about his wife Carla and their dream. She’d been anxious to come with him into this hell. He had kissed her and told her no… no wife of his would suffer in a place like this. In seven months, he would be a father. The foreign company running this operation was taking good care of her. She’d written last week that the company had paid for a test with a machine that was like an x-ray but used sound. The nurse had told her the baby would be a boy. Diego smiled with that memory… it was a good one. He would have a boy who would grow up to be his friend. That was a new part of the dream; the old part was still a small house outside Maceio, the coastal city where Diego was born. Diego instinctively slowed the dozer to the speed of a man’s stride. He squinted watching a cloud of rain moving toward him along the path he’d just cut from camp. The rain didn’t appear heavy, but when mixed with ground steam it was solid enough to bring a false twilight. Nothing could be seen inside the cloud. The dozer had a roll cage. A piece of corrugated sheet metal had been welded to the top of the cage as a roof. Diego switched on spotlights. Drops started hitting the sheet metal with rhythmic pings. The humidity grew heavier. The air surrounded him like a damp towel. He pulled off his t-shirt and wiped his face with it. A storm of birds fled from some trees his dozer was about to consume. Their colored shapes moved past him at eye level like watercolor paints in fog. Diego cocked his head to one side. He sensed something wrong. Grinding the shifter into neutral, he idled the machine. As the noise of his engine simmered down, he was able to hear the far off sounds of a dozer racing at top speed. He heard an engine revving at its highest rpm… no, it was two engines. More than one dozer was racing through the forest. This was very unusual. A hollow feeling began gnawing inside his chest. He remembered stories of odd things that happened to people alone in the forest. He heard a different sound like a wet towel hitting the ground in front of him. He leaned forward, squinting into the fog. A bird tumbled from the air bouncing off the cab, the sound startling Diego badly. The bird fluttered, then righted itself on the ground and took off. He saw another bird fall a couple yards away, then another, and another. They would roll around a bit, then fix themselves and fly off. This was very strange… too strange. He now understood why dozers were racing through the forest. Something very bad was happening. He shoved the dozer into gear and slammed his feet into the pedals. The beast jumped forward at top power. He heard muck spitting into the air off the backs of the tread-plates. To devil with cutting the second track. To devil with the money. He was going to get out of here as fast as this dozer could race. The treads were clanking at an accelerating pace as the beast slowly picked up speed. He disengaged the tree saw to gain a few more drops of power. He plowed through the top of a tree he’d cut earlier, then another. He was doing close to ten miles per hour. A man might run faster, but not through this brush and not for the miles that remained to the camp. Without warning, he felt dizzy, an ill kind of dizzy. The fingers on his right hand went numb, then paralyzed. He tried to move the fingers, but they were limp. Coldness was spreading up from his hand. The more he tried to flex his fingers, the worse it got. In seconds, his entire right arm was hanging flaccid at his side. Whatever had gotten the birds was working on him. He knew it. The trees kept moving past him in a blur. He realized with an odd disconnect that he was having difficulty drawing breaths. He thought about Carla and the baby. His jaw squeezed tight. His lips formed a grim line. He would make it for them. The dozer glanced off a large tree and kept going. The impact rocked him. He wheezed, attempting to draw air into his chest. Maybe two miles remained until base camp. He began veering off the trail. The saw-blade snagged on a mahogany six feet in diameter. Diego was pitched from his seat. Dizzy and unable to hold on, he fell from the cab. His shoulder hit a moving tread-plate, which tossed him off the rig. He was like a paralyzed sack of meat. “Umph!” He landed on the ground. He thought how odd it was that he’d bounced. He didn’t know people could bounce when they hit the ground. The tractor rumbled beside him. Without his feet on the pedals, the dozer had stopped. The left side of his face was a mix of blood and dirt. He tried to draw air into his lungs but failed. His mind felt like it was beginning to evaporate. His entire body tingled. He felt no pain. The muscles that worked his lungs were no longer responding. He thought of calling for help, but without his lungs he could do nothing. He gave up struggling and stared skyward at the treetops and thought of Carla. Moments later, his heart stopped beating. He felt calm as what was left of his mind faded into a warm nothing. Sarah Mayfair opened her eyes. The nightmare was still around her. Her vision was not in this world but in some other. The nightmare was of underground water, great arteries of rivers and streams and lakes. Where the liquid pooled, it was cool and deep. She sensed this water was alive with thoughts, evil thoughts. A teaspoonful of it teamed with plans of death. She was floating deep under the water, staring as drowned people glided past her face sinking into the depths of a bottomless pool. Looking down, she saw a trail of countless tiny bodies slowly pirouetting as they drifted into the yawning darkness below her feet… Headlights from a car traveled across a wall of her room. The lights dwelled on a wooden credenza, then moved on. She followed the glow with her eyes seeing reality for the first time. The simple act of seeing began to clear the veils of her nightmare. Her breathing slowed. She realized she was covered in sweat. Outside, a subzero wind was blowing unimpeded through a forest of leafless trees and ice crusted snow. The windowpanes rattled and hummed. Small drafts snuck through the rooms. She shivered as the drafts caressed her dampened skin. She was in the living room of her home. She recognized the shadowy details of furniture and walls. Her boyfriend Kenny was in the bedroom asleep. She remembered getting up and walking out here to be by herself to think. The nightmares had grown worse, more of them with each passing week. She was starting to see the faces of people she knew in these nightmares. She sensed it was some kind of horrible parade of those who would die. She remem-bered Kenny’s image from the dream. Her body stiffened. A disembodied voice was whispering into her left ear. The words were unintelligible… garbled, but unmistakably evil. This can’t be happening. She screamed out in frustration and grief at the seeds of budding madness.